In its 15 year history, the RMU Men’s Hockey team has featured numerous Pittsburgh-area hockey products on its roster- many of whom have been vital to the program’s success. Zac Lynch is the program’s second all-time leading scorer, Colin South and Brendan Jamison are former captains, and these are just a few of the noteworthy ones. Later this week, Denny Urban, a Pittsburgh native and member of the class of 2011, will receive one of the greatest honors possible for a student-athlete. 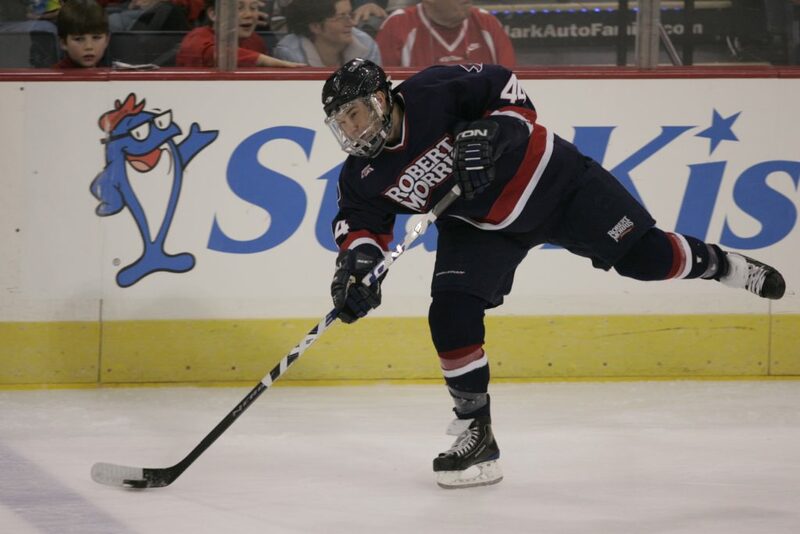 As the program’s all-time leading scorer among defensemen and eighth overall, Urban is one of the best players to come through the Colonials program. He earned all-conference honors in each of his seasons, was voted best defenseman his senior year and was a key part of some big wins. He’s gone on to continue to have a role in the hockey world as a player and now official. All of these accomplishments will surely be mentioned by RMU on Friday, when he will be inducted into the RMU Athletics Hall of Fame. Urban grew up in Whitehall, playing for local teams like the Mt. Lebanon Hornets, Amateur Penguins and Pittsburgh Hornets. Like many youth hockey players he started out playing forward, until he was one day asked to make a switch to help out the team. Around the age of 13 George Ferguson, his coach and a former NHL player with nearly 800 games of experience, approached him about making the switch back to defense. He obliged, and that wound up being the catalysts for his illustrious career. As a defenseman, Urban continued to climb up the ranks, playing his first year of juniors in the NAHL for the Mahoning Valley Phantoms. He produced 30 points in 57 games, which was enough to garner significant USHL attention. He was drafted in the first round, ninth overall, by the Omaha Lancers. The defender went on to produce 18 points in 42 games between the Lancers and the Ohio Junior Blue Jackets. Next came the college commitment process. Admittedly, the small local school with just three years under its belt wasn’t a household name to Urban at first. However, Coach Derek Schooley was able to sell him on the opportunity and he chose to attend RMU. The opportunity to play all four years was a present for the young man, and Urban made the most of it. He appeared in at least 30 games during each of his four years, totaling 136 over his four seasons as a Colonial. He also produced at a very high level during this time, with 28 goals and 84 assists for 112 points during his career. This total ranks eighth in program history and most among defensemen. The adjustment from junior hockey to college hockey is often difficult. Even players with elite potential can struggle to play at the required level early on in their careers. It can be even more difficult for defensemen, who are now playing with a whole new crop of players in a style that can be much more intense than juniors. To add another element, Urban would be considered an under-sized defenseman at 5 feet 10 inches. Urban defied all of these odds, producing 21 points as a freshman. He was pretty much thrown right into the fire from the time he stepped on campus. However, the chance to play early and often at the collegiate level is something that he thinks was significant in his ability to be so successful during his entire career. Urban wasn’t the only member of the team to adjust quickly as a freshman.. His classmate, forward Nathan Longpre scored 24 points as a rookie and continued to be successful during the remainder of his career. He finished with 138 points and left as the program’s leading scorer at the time. He has since been surpassed three times, but nonetheless had a remarkable RMU career. Longpre and Urban were both key contributors for the Colonials over their four years, and Urban is thankful that they were able to spend so much time playing together. Those two put up impressive individual numbers during their careers, but also helped the program reach new heights. The first of these noteworthy accomplishments were winning the Frontier Classic in Alaska- including a victory over No. 8 Boston University. In their junior year the team had one of the most significant weekends in program history- a sweep of No. 1 Miami during a home-and-home series. Urban had a goal and three assists on the weekend. These were some of the early, big victories in program history, establishing an impressive reputation that the Colonials would always put up a fight no matter how big or intimidating the opponent was. That mindset was evident in the locker room, and has lived on in the form of big wins over ranked teams ever since. Although the Colonials had growing pains as a new program, the culture of winning began during the tenure of the class of 2011. The tide began to turn, and the Colonials produced an 18-win season during Urban’s senior year, one in which he served as an alternate captain. It was the first winning season in program history and the program has continued to be successful. It’s clear that Urban had an extremely successful RMU career. He earned a spot on the all-rookie team, then a spot on the all-conference first team the next three seasons, including being named the conference’s best defender as a senior. This week, Urban will officially receive formal recognition for his success as a member of the RMU Men’s Ice Hockey Team from the university. He will be inducted into the RMU Athletics Hall of Fame along with four other individuals and one team. He will be the third men’s hockey player to receive this honor, joining Chris Margott and Longpre. On top of the individual meaning, this recognition is a little more special since he will be joining his former roommate and longtime friend in the Hall of Fame. “With the four years we spent together and helped out the program, to have Nathan in the Hall of Fame with myself is something that I know we both greatly appreciate,” he said. While his hockey impact was certainly felt at RMU, that is not where Urban’s impact stopped in the hockey world. Like many successful alums, he went on to have an impressive professional hockey career, including stops in the ECHL (Reading, Kalamazoo), AHL (Worcester, San Antonio, Springfield), NHL training camp (Florida) and the DEL in Germany (Straubing). Over this time, he continued his offensive prowess, totaling 143 points in 265 pro games. While he had many great memories and experiences in each of these stops, his last stop definitely meant a lot to him. His career as a player came to an end in 2015, but after a year away from the game, Urban decided he was ready for something new. Having spent so much of his life playing hockey, there was a definite void without it. After a conversation with a former Colonial teammate, he was ready for his next step: officiating the game. “I had a conversation with Furman South and the rest is history, I got into it,” he reflected. Furman South, a member of the class of 2012, is now an NHL referee. He was one of the early beneficiaries of the NHL’s officials combine and has since risen through the ranks. Brandon Blandina and John Rey are other RMU Hockey alums that followed in his footsteps and are pursuing careers as officials as well. After that conversation with South, before the 2017-18 campaign, Urban attended the combine in Buffalo. This year, he’s officiating at a variety of levels, including the PIHL, Midgets, and the ECHL. The experience has been good for him so far. Urban has made an impact during each stop of his hockey career. Nearly 8 years after he graduated from RMU, he’s continued to have success in the hockey world. As he looks back, his time at RMU is something that he definitely doesn’t take for granted. Being inducted into the RMU Hall of Fame is now something that will cement his place among the university’s best. Editor’s Note: Urban will be formally inducted into the RMU Hall of Fame on Friday, February 8th during the Hall of Fame dinner at the Sheraton Pittsburgh Airport. He and the other four individual inductees and one team will be recognized during halftime of the men’s basketball game on Saturday.